I look in the mirror and I can see the traits my father had. The errant eyebrow twisting out from the other hairs, the narrow face. Growing up, people always said I looked like my father and that my brother looked more like my mother. Looking in the mirror now as I comb my hair, I see the eyes. Lately, my eyes have been tearing for no apparent reason, and tearing a lot. Just the way my mother’s eyes teared. She was always dabbing away tears. I don’t know… My eyes just keep waterin’. She said that often. Now, it is my eyes that are watering and there’s nothing I can do about it. I look worried, despite feeling fine. I look like I have a permanent scowl. I got my kidney disease from my mother. Is that what causes the constant look of sadness? I look in the mirror now, and I see my mother. My father has receded. And she and I are in the foreground. Just like it used to be. This past November, I participated in National Novel Writing Month (NANOWRIMO1) for the first time. Trying to create a novel of 50,000 words in thirty days is quite a task. Unfortunately, I did not succeed in that goal, however I learned a great deal in my effort. No character or story is written in stone when in the creating process. I was totally surprised at how it forced me to think about the story in a different way when faced with a word-count deadline. Save the editing for later… It can slow you down. A lot. Writing 600 words is easy,… 1,667 words2 is somewhat more difficult. These are the principal ideas I came away with. For the record, I finished on November 30th with 37,228 words. That’s right. Only 12,712 words shy of the goal. Why? Because I procrastinated too many days and toward the end, I literally got sick. In the bed sick. My illness is not the issue now. It’s January and NANOWRIMO continues to push me with editing what I have written and getting my work read. 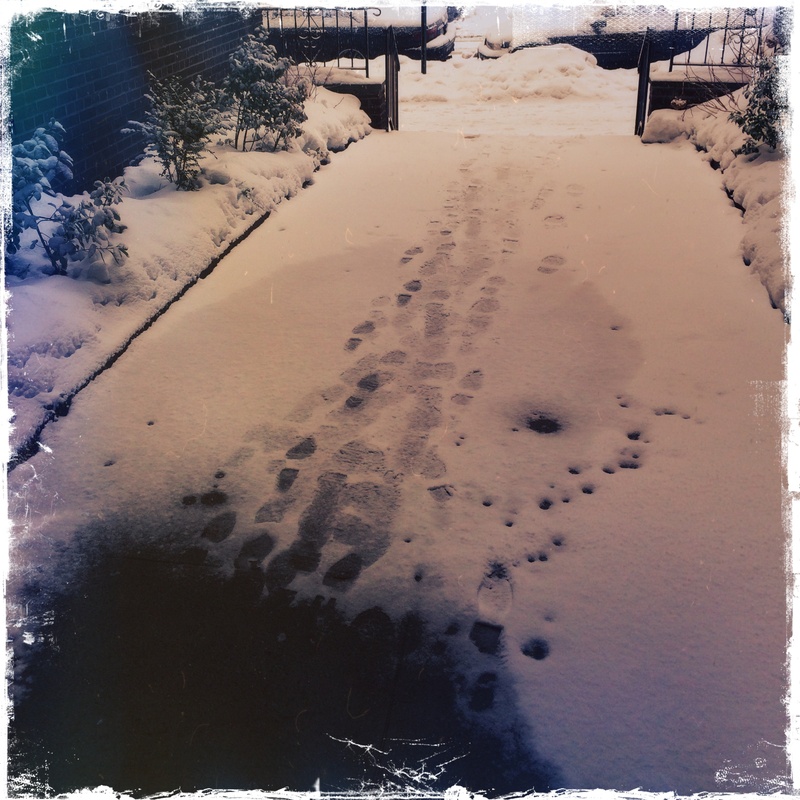 So I continue working on my story and learn more about where to proceed from here. Meanwhile, that story that was bottled up for so long, seems to have allowed other ideas and stories to bubble to the surface, and now my biggest issue is determining which story gets priority. I may or may not ever publish anything, but I am really enjoying this entire process. Are we there yet?, film, Is this politics? I thought I was tired of the blockbuster summer movie busts, but here I am, anticipating yet another one. Basically it’s because this new one has two of my favorite actors in it. 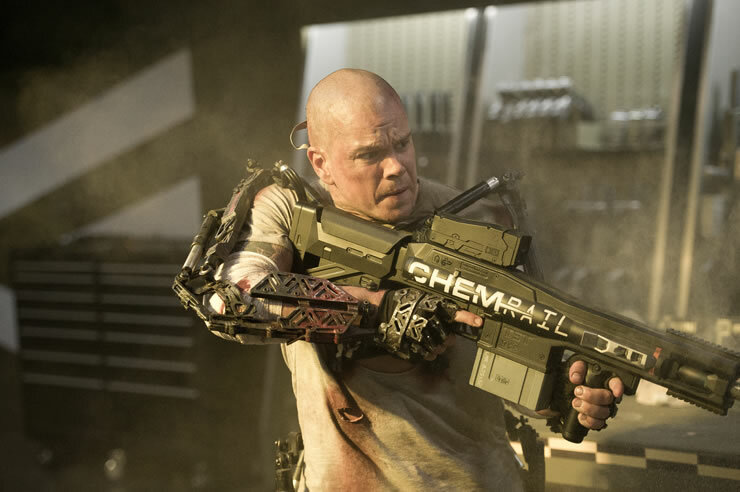 Jodie Foster and Matt Damon are being billed as the stars of the movie Elysium1. Both are known for choosing movies with interesting subject matter, so this looks promising. Neill Blomkamp, the director of District 92 is also directing this film. Apparently Elysium will explore more of the same types of themes. This time dealing with issues such as immigration, health care and class issues. Seems pretty timely. Apple, You've got to be kidding! Here’s a little treat on a Monday morning. A number of premium iOS apps and games have been discounted to nothing over at the App Store, including the charming and mildly addictive Tiny Wings (and Tiny Wings HD for iPad), Traktor DJ (normally $20), Superbrothers: Sword and Sorcery EP, as well as Infinity Blade II (usually $7). 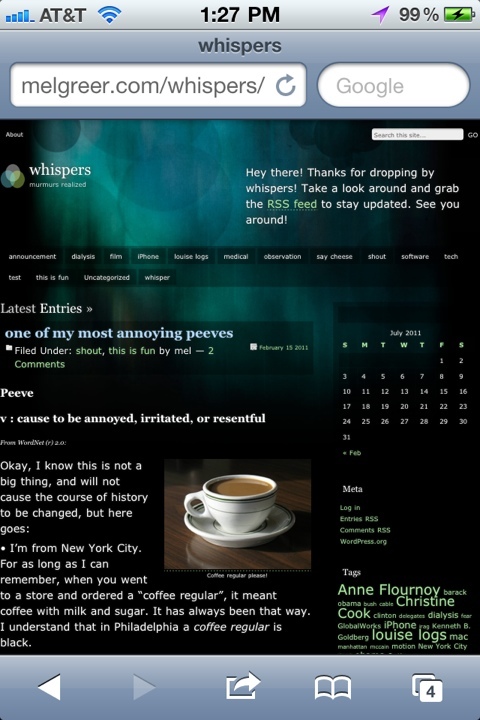 My blog called Whispers has died. It crashed and so far, I have not been able to revive it. I’ll keep trying for a while but I’ll have to accept its demise. Meanwhile some of my more personal musings can be found on G+.